Tracy Carr handing over the charity cheque to Emma Wright in front of the new Macmillan Support Centre at the Royal Cornwall Hospital in Truro. 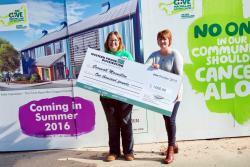 The Cove Macmillan Support Centre in Cornwall welcomed a donation of £1000 from Western Power Distribution recently. WPD is lending its support to this year’s Christmas Fair at the Eden Project where Macmillan hopes to raise an incredible £50,000. Emma Wright, Fundraising Manager for Cornwall and the Isles of Scilly said: “We are delighted to have the support of WPD for this year’s fair. Twenty one thousand people are living with cancer in this region and we wanted to build a dedicated support centre which will enable us to offer the very best care and support to cancer patients and their families. “The fair itself is a wonderful opportunity to shop, socialise and get into the Christmas spirit while helping a local charity.” Funds raised will all go towards the build.